Cycling from Lhasa to Kathmandu. Do you have a taste for adventure? Then this one’s for you. We chatted with our friends at Exodus Travels – adventure specialists who pride themselves on taking intrepid travellers beyond the mainstream to enjoy sustainable, culturally-sensitive, one-in-a-lifetime experiences – to put together this adventure bucket list. The Amalfi Coast is one of the most dramatic and beautiful coastlines in Europe. Away from the trails there is plenty of time to partake in the traditional Amalfi pastimes of sampling incredible food and wine, as well as enjoying the Mediterranean climate. Highlights include walking the Sorrentino Peninsula, visiting Amalfi, Ravello and Positano, and exploring the fascinating ruins of Pompeii. Cuba’s music, beaches, old cars, striking architecture and revolutionary history combine to make the perfect cultural destination with a lively atmosphere. Highlights include cycling the length of this idyllic Caribbean Island, soaking up the culture of Havana, seeing Trinidad and Santiago first hand, and relaxing with a mojito after a day’s ride. The Masai Mara, a vast grassland stretching across Kenya, Uganda and Rwanda, teems with animals. Expect an astonishing mixture of game, including lions, cheetahs and at certain times of the year, the wildebeest migration. Bird enthusiasts will particularly love Lake Nakuru, pink-rimmed with thousands of flamingos, and where there is a healthy population of White and Black rhinos. The highlight of the trip is undoubtedly seeing the gorillas in the foothills of the Parc National des Volcans in Rwanda. This close-up encounter is arguably the most sensational wildlife experience of them all. The Serengeti, Ngorongoro Crater and Lake Manyara: Tanzania’s most prolific national parks. The Exodus safari starts with Lake Manyara and its fantastic birdlife with over 400 recorded species, before continuing on to the iconic Serengeti National Park. Tanzania’s flagship park is contiguous with the Masai Mara and it is not uncommon to see lions, cheetahs or even leopards. The giant caldera of the Ngorongoro Crater boasts stunning scenery as well as prolific wildlife, whilst Tarangire National Park is famous for its herds of elephants which can number in the hundreds. Taking you to the most iconic base camp of all, at the foot of the greatest mountain in the world (Mount Everest soars 8848m above sea level), this is the trek to conquer for an adventure traveller. Walking through Sherpa country past cultivated fields and small villages, travellers will have time to acclimatise before reaching spectacular high altitude scenery, taking in the incredible monastery at Thyangboche, views of Ama Dablam, Everest itself and other mighty Himalayan peaks. As well as reaching Base Camp, you can climb Kala Pattar (5545m) for a breathtaking view of the highest mountain on Earth. This is one of the ultimate biking challenges, which features rugged beauty, vast landscapes, brilliant skies and glittering peaks. 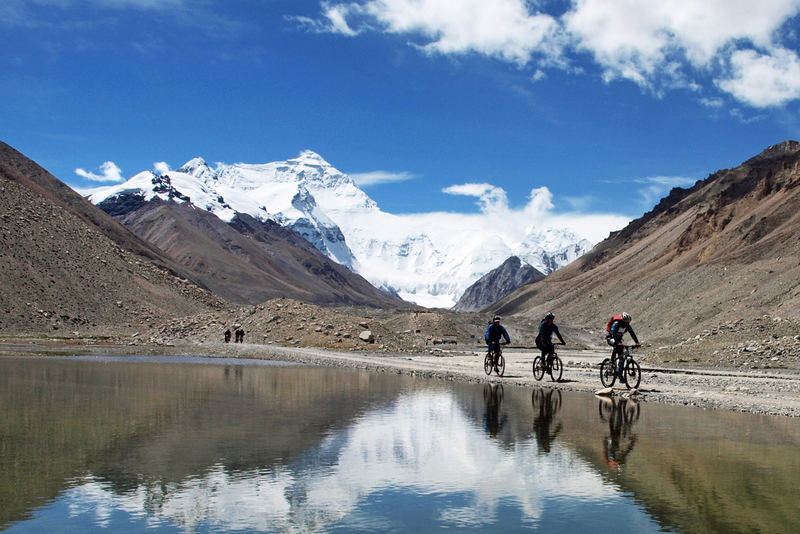 Here you can expect to pedal across high altitude desert, over awesome mountain passes, before stopping off at Rongbuk Monastery and Base Camp for views of the north face of Everest, followed by a 160km, 4600m descent into Nepal and the lush Kathmandu Valley. In recent years much of the route has been surfaced making it perfect for cyclists. Although it promises to be a challenge, the spectacular beauty of Tibet and a sense of achievement is also guaranteed. With its gentle gradient and sense of unspoilt wilderness, the Rongai Route approaches Kilimanjaro from the north and is less crowded than the most popular trails. Taking in farmlands, forest and alpine moorlands on the way to the scenic summit, this route allows an extra day for acclimatisation under the imposing spires of Mawenzi, before the arduous final ascent. The final climb begins in pre-dawn darkness but the reward is an incomparable sunrise vista over the sweeping East African plains. China’s most famous monument, the Great Wall, is in fact many walls built over many years, but all with the same purpose: keeping out the northern hordes. Far from the tourist crowds, you can visit both dilapidated and rebuilt stretches, to get a great sense of the scale and the majesty of this remarkable piece of engineering. Some of the main attractions are in the lesser-known sections of the wall, places that the vast majority of other tourists do not see. While in the area, you can also expect to see rural life first-hand, explore the Eastern Qing Tombs, and visit Beijing’s Tianamen Square and Forbidden City. It really is a special place to explore on foot.